Pollen is susceptible to genetic and environmental factors. Analysis of its quality should be a routine step in breeding, seed and fruit production to reduce failed crosses and costs while increasing the predictability of the process. Pollen quality is classically determined by viability stains and/or in vitro germination assays. However, each method has its species-specific limitations in terms of applicability, reliability, reproducibility, relation to seed/fruit set. Recently, a new method which is based on the electrical properties of cells, has been described for numerous plant species. Pollen quality can now be determined in a stain-free, species-independent, reliable and standardisable manner. This new method and the instrument, an impedance flow cytometer (IFC), has been developed by the Swiss company Amphasys (www.amphasys.com). Acepo uses the newest technology from Amphasys for the analytical service. 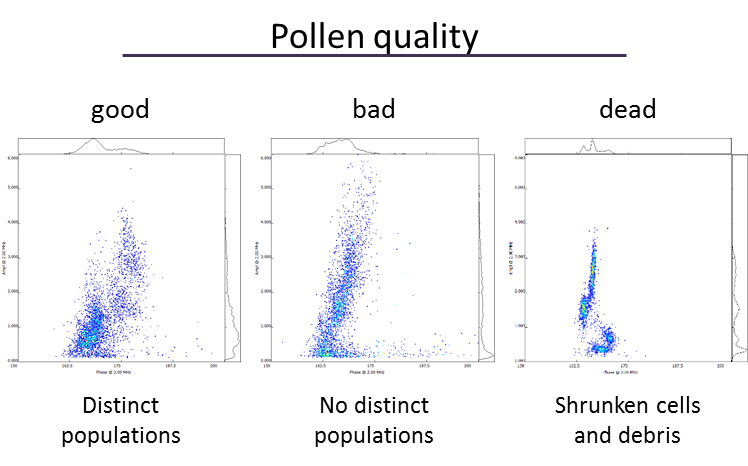 As the method discriminates between dead, viable, and germinating pollen grains within a sample, each class can be easily quantified. It has been reported that integration of this technology in pollinations and bio assays increased the productivity by 30%. 1. Pollen analysis supports the selection of parental lines. Pollen formation is under tight genetic control. Subsequently, genetic mutations in gene controlling pollen development result in poor pollen quality, a reduced number or no pollen at all. Male-sterile lines with no pollen are ideal mother lines for hybrid seed production in insect-pollinated species. Male fertile lines with a high number of viable pollen grains at all environmental conditions are ideal father lines. The image on the right shows an example of apple pollen deriving from different varieties including a created dead control. Depending on the species, their pollen quality is affected by environmental factors like heat, light, pollution, or certain pesticides. The optimal conditions can be determined by designing suitable experiments accompanied by measurements. The image on the right shows the reaction of pollen deriving from five different species to a temperature gradient. 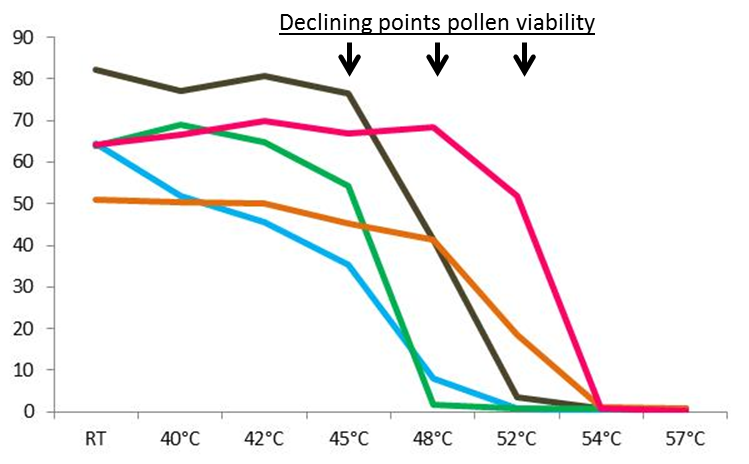 While some pollen survive the exposure to more than 50 °C easily (pink line), others are alredy dead at 45 °C (green and blue lines). This implies that each species has its optimal growing temperature which should not be exceded for high pollen quality production. 3. Pollen analysis supports the development of harvest and storage protocols. Many breeders and producers use stored pollen for practical reasons. The pollen is harvested, dried and usually frozen. To maintain a high pollen quality during storage, the pollen should be harvested at its highest quality. However, pollen viability can change with the life time of the individual flower and during the day, depending on the light conditions. The image on the right shows an example from Begonia where the closed bud (left) and the just opened flower (middle) have viable pollen (population at the right hand side of the line) which is absend in the older flower with the elongated petals (right). Not all pollen storage and reactivation protocols are applicable to all species and have to be developed accordingly. Additionally, some genetic factors can affect pollen longevity during storage. In an experimental set-up including IFC measurements the best storage and reactivation conditions can be determined. The image on the right shows an example of pollen that has been stored at room temperature (RT) and in the fridge (4 °C). 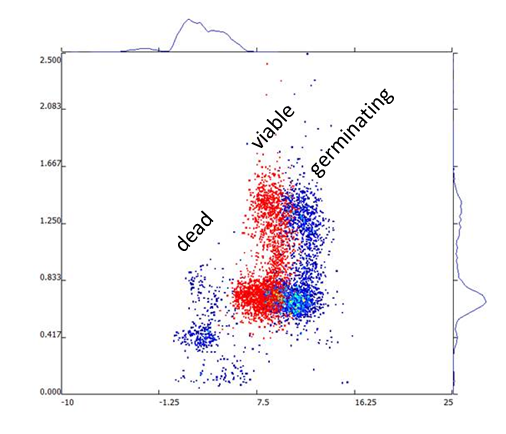 The viability determined by IFC (line) and in vitro germination (dots) has been determined from the same sample. The data demonstrate that pollen of this particular species can be stored for at least ten days in the fridge without an extreme decrease in quality. The sample stored at room temperature is not suitable for pollinations from day seven onwards. 4. Pollen analysis prior pollination enhances the predictability of fruit and seed production. With respect to the factors influencing pollen quality it makes sense to control its quality before entering the labour intensive process of (hand) pollinations either in breeding, fruit or/and seed production. Consequences of pollinations with low pollen quality are smaller fruits and a reduced number of seeds per fruit. The ultimate goal of the pollen quality analysis is to find a correlation between pollen viability, germination, fruit, and seed set. A reliable estimate of pollen germination enhances the predictability of the production process, provided that the parental lines are compatible. 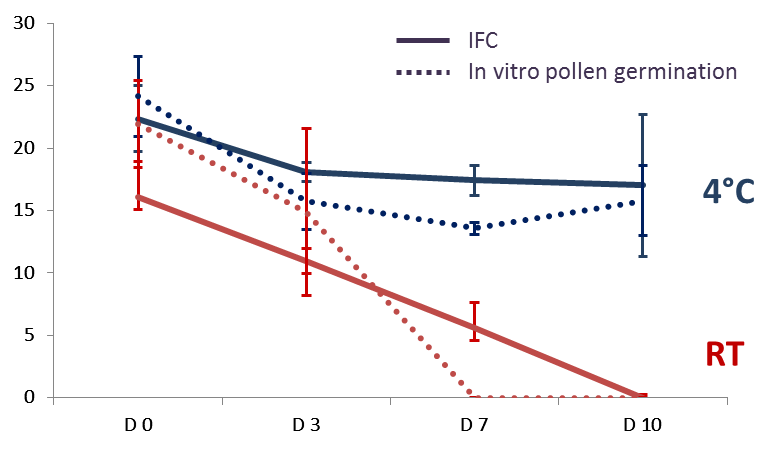 It has been shown that IFC can detect the pollen population with germination capacity (Heidmann et al 2016, PloSOne e0165531) which is unique for this method and reduces the long waiting time for the germination results. 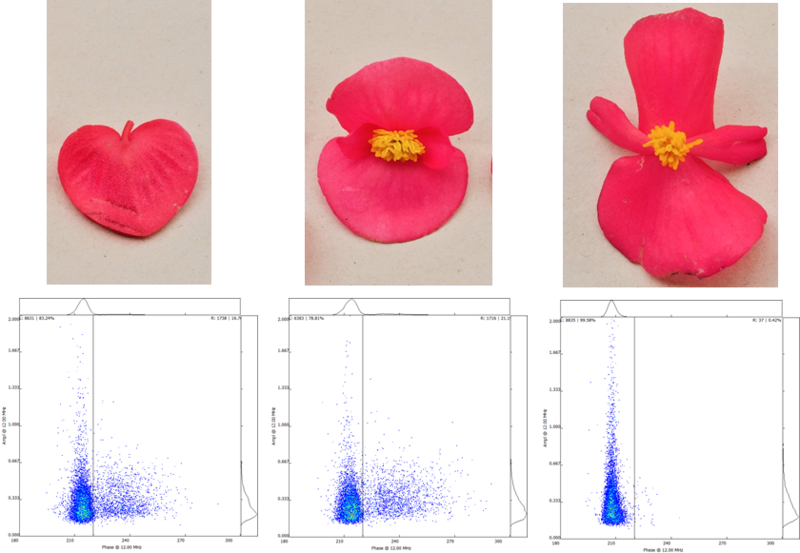 The image on the right shows a modified image of the PloSOne publication of tomato pollen where the three populations, dead, viable, and germinating can be analysed in a single measurement. Pollen grains have a high similarity to fungal spores which can also be analysed for similar purposes, especially in relation to bio assays e.g.in phytopathology. Other cells that can be analysed are bacteria, yeasts, and algae. Let’s give us a try! 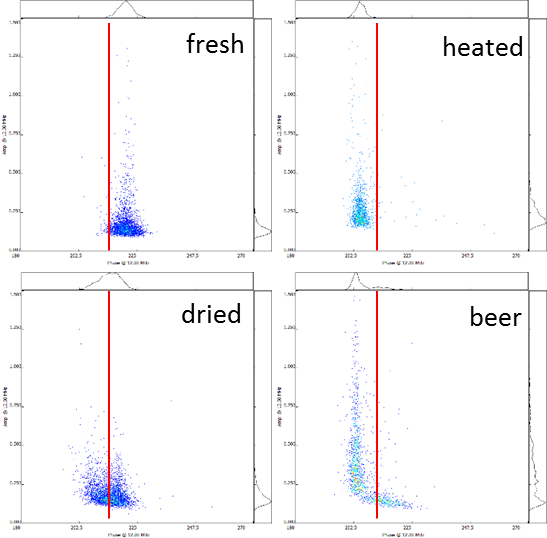 The image on the right shows an example of IFC measurements of yeast cells with different origin. Almost all of the fresh yeast cells are viable compared to the dead (heated) control. Although yeast cells from the dry sample were incubated for one hour at room temperature, they are less viable than the fresh ones. Yeast cells from a beer bottle are also not viable. Anyone is interested having a pollen analysis performed on his/her material should contact Acepo to specify the questions that need to be answered. For R&D or I&E projects Acepo should be contacted for more information and possibilities.